Hello Claudia and thank you for taking time out of your busy schedule to be with us today! It is a great pleasure to be part of this and thank you for the opportunity to share my experiences with all the excited brides !! 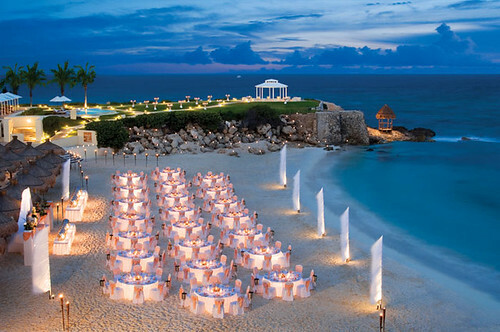 Okay, so first question ~ how long have you been helping plan dream-come-true weddings for the Dreams resorts? I started with AM Resorts 6 years ago, I think I have planned about 1,000 weddings, more or less. WOW, a thousand? Haha! I bet you have seen it all! What is your favorite part about your job? As most of the girls…I think my favorite part is when the couple is just right there at the Ceremony at the gazebo overlooking the water, holding both hands, exchanging vows, a wonderful couple happy, connected, so much love around and you even feel it, it is a special moment…Isn’t it romantic???? Awwwe, full of romance certainly. With the gazebo at the resort it is inevitable. What are some of the most fun/memorable weddings you’ve planned? I remember a lovely bride singing to her future husband while she was walking to get married to him, all their family guests & friends were crying even me & the minister, it was so emotional !!! I have seen & experienced a lot of funny moments too I graciously remember a wedding on the beach. It was a very hot summer and at the end of the ceremony at the photo session everybody from the wedding party jumped into the ocean…….they wanted me to do the same but I was still working!! I wish I could have!! But the funniest was when I fell down just in front of a garden reception, more than 50 people around and just in front of the Mariachi playing a happy Mexican song…it was sooo embarrassing for me !!! Oh no! Haha! I’m sure it just lightened the mood. 😉 How do you feel about wedding favors? Have there been any impressive or creative ones that made you stop and admire? Yes of course! I always have the opportunity to see all of them, a lot of great ideas and unique details, when I see them I always think about all of the time and dedication a bride puts into personalizing and creating their own ideas, it gives a special touch to the wedding and it is a token of their appreciation to all of their friends and family attending their wedding. Take in consideration that most of the Destination Weddings have slow season months and they can find very special deals with airfare, hotel, etc. Make sure to think of all additional items you want for the wedding. Sometimes there are useless things you probably will not need and will help you save some money, also consider items you can do yourself (DIY). 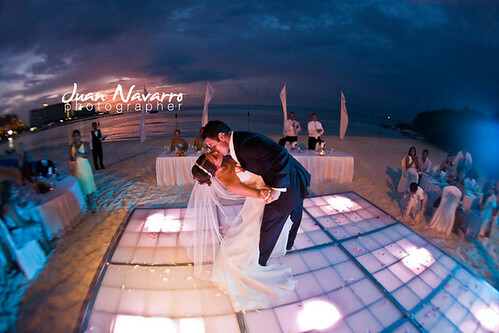 Is there anything new and exciting going on with Dreams Cancun weddings? We have a new renovated gazebo !! Yes, I know! It looks so much more modern, simple and beautiful. Okay, last question ~ If you were to give some tips or advice to a soon to be bride, what would it be? 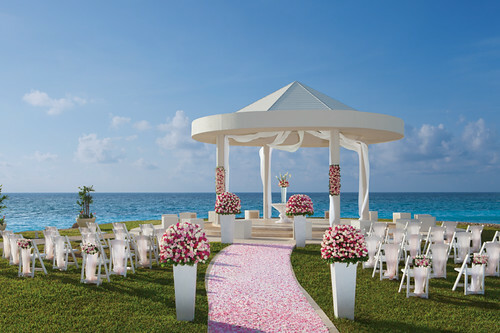 Dreams Cancun Gazebo is a unique location for your wedding. Choose the place perfect for you, close your eyes and imagine you and the man you love at the perfect spot…and go for it !! Wedding Coordinators are always willing to help you plan last minute things, do not get stressed, remember the only and most important thing is you. Well said. Thank you again Claudia. 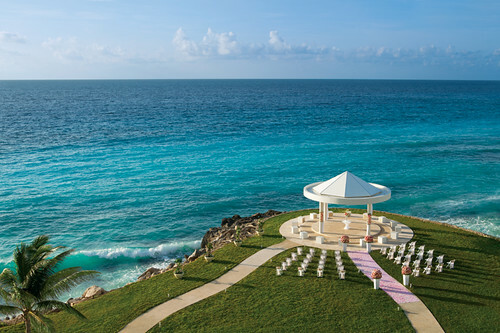 🙂If you are interested in having your wedding vacation held at the Dreams Cancun feel free to call us at 972-517-9130 or toll-free! 1-866-329-7157. We are here to help you find the precise location for you and your guests then between us arranging the travel arrangements and the resort’s wedding team your special day is sure to be as blissful as possible. We are here for you as well as some of the best coordinators in the world like Claudia. It’s what we do best!